A helicopter plucked two frostbitten Dutch climbers from the world's second-highest mountain Monday after an avalanche left at least 11 people missing and believed dead. The helicopter brought Wilco Van Rooijen and Cas Van de Gevel from K-2's base camp to a military hospital in Skardu, the nearest town, said Maj. Farooq Firoz, an army spokesman. But stranded Italian climber Marco Confortola, also believed to be suffering frostbite, was struggling down the mountain on Monday, still too high for a helicopter rescue, Firoz said. Thin air generally prevents choppers from flying above 19,700 feet. The avalanche struck more than 26,250 feet up the mountain. K-2, which lies near Pakistan's northern border with China, is regarded by mountaineers as more challenging to conquer than Mount Everest, the world's highest peak. K-2 is steeper, rockier and more prone to sudden, severe weather. The reported toll from the avalanche was the highest from a single incident on K-2 since at least 1995, when seven climbers perished after being caught in a fierce storm. Shahzad Qaiser, a top official of Pakistan's Ministry of Tourism, said Monday that all climbers who had been caught on K-2 during the avalanche were accounted for. Officials and expedition organizers said about two dozen people, mostly foreigners, in about eight different groups attempted to scale K-2's summit on Friday. As the mountaineers descended, the avalanche cut ropes used to cross a treacherous gully 1,148 feet below the 28,250-foot summit, said Nazir Sabir of the Alpine Club of Pakistan. Falling ice apparently swept some of the victims to their deaths and stranded others at a height where they would quickly succumb to exposure and exhaustion. At least two of them fell on their way up the mountain, before the avalanche. Sabir, a veteran Pakistani climber who helped organize one of the expeditions, also put the death toll at 11, including a Nepali sherpa and a Pakistani porter who died while trying to help others after the ice fell. The two Dutch climbers and the Italian managed to cross the treacherous gully, known as "The Bottleneck." Other climbers met them en route and helped them descend. Among the survivors were two members of the Korean group who also made it back to the base camp, which lies at about 16,400 feet, an organizer of their expedition said. Chris Warner, an American who climbed K-2 last year, said the gully was the deadliest place on the mountain, with an unstable ice wall above and a fall of up to 9,000 feet (2,740 meters) below. "You can see how, for people who were exhausted, it would have been nearly impossible for them to descend without the ropes," said Warner. He said hope was fading for anyone still alive and separated from their group. "Once their hands and feet are frozen, they really are unable to move on their own power, and it takes other people to carry them down," he said. 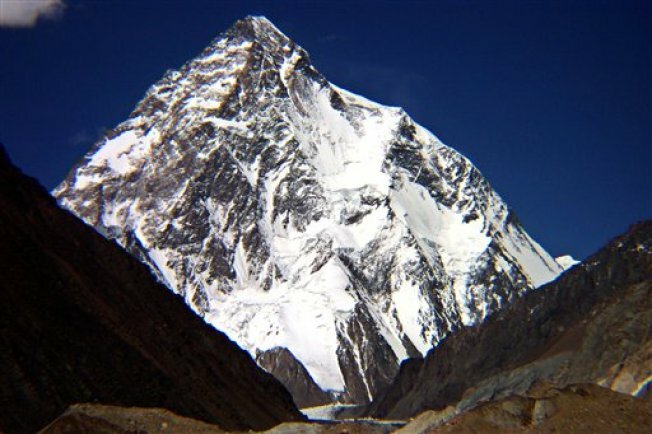 K-2's peak is about 785 feet shorter than Mount Everest's, but is a "phenomenally dangerous mountain," said Alan Arnett, who climbed a nearby peak with at least one of the missing climbers. Compared with Everest, "it's more technical, it's steeper, the weather is more intense," he said. About 280 people have summited K-2 since 1954, when it was first conquered by Italians Achille Compagnoni and Lino Lacedell. Dozens of deaths have been recorded since 1939, most of them occurring during the descent. Associated Press writers Zarar Khan in Islamabad, Lily Hindy in Washington and Kwang-Tae Kim in Seoul, South Korea, contributed to this report.